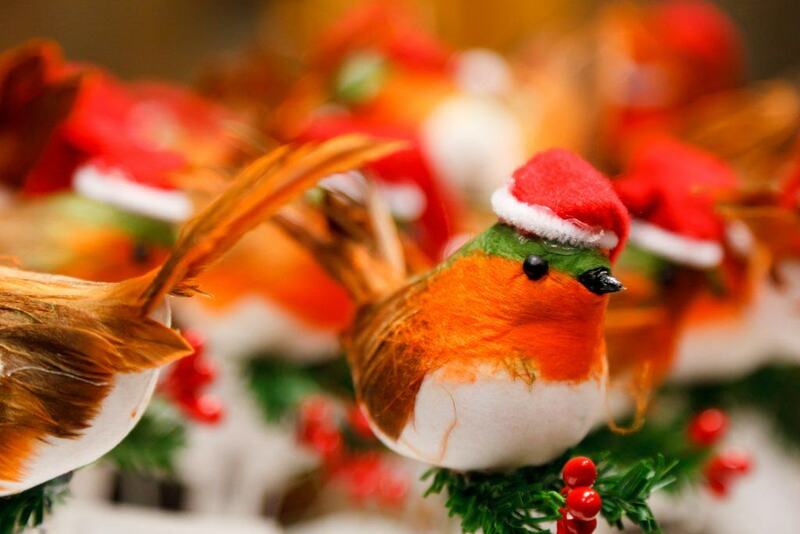 We associate many plant and animal species with the festive period. But, have you ever stopped to wonder why we eat turkey, decorate Christmas trees or buy a plant that is native to Central America? The roots of many species involvement in our Christmas celebrations can be traced back to Pagan times, latterly incorporated by Christians into religious holidays. Whilst the source of other Christmas traditions are more recent, or a little harder to track. Here, we look at some of the most common species that we use as decorations, eat or adorn our Christmas cards with and consider, why? Pagans considered Holly (Ilex sp.) to be a sacred plant long before it was associated with Christmas. 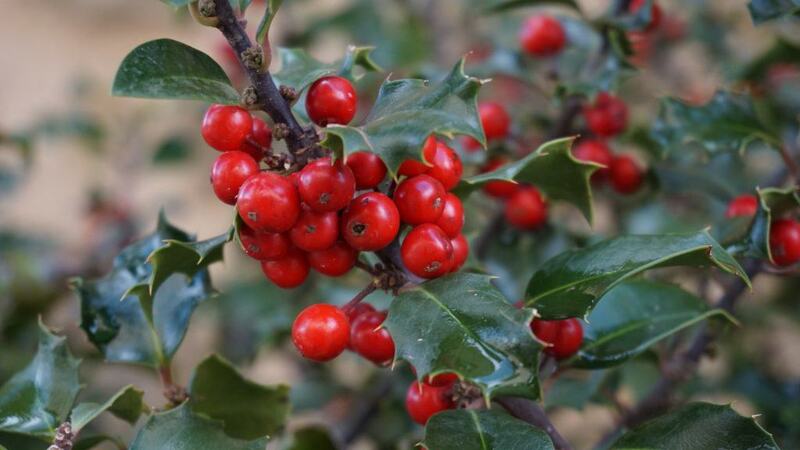 This is thought to be because while other trees shed their leaves in winter the Holly tree remained strong, with its vibrant green leaves and red berries. Pagans also hung it from windows and in doorways to fend off evil witches and spirits. Christian’s believe that Holly symbolises Jesus in two ways; the red berries representing the blood he shed on the cross and the spikey leaves symbolising the crown of thorns. It has also been suggested that the cross upon which Jesus was crucified was constructed of Holly and that this species sprang from his footsteps as he walked. Less frequently held beliefs include that Holly’s white blossoms represents purity and the idea that if the Holly used to decorate a home for Christmas is prickly, the man will rule the house for the coming year. But, if the holly used is smooth, the woman will rule. In Pagan times, Holly was thought to be a male plant and Ivy (Hedera sp.) a female plant. An old tradition in England says that whichever species was brought into the house first over winter, indicated whether the man or woman of the house would rule that year… But it was considered unlucky to bring either into a house before Christmas Eve. Some believe that Ivy, which must cling to something to support itself as it grows, reminds us that we need to cling to God for support in our lives. The use of Ivy during winter also goes back thousands of years. The fact that Ivy, like some hollies, stayed green throughout the year led some to believe it had magical properties and led to its use as home decor in the winter months. It symbolized eternal life, rebirth and the spring season. For a period, Ivy was banished as a decoration by Christians due to its ability to grow in shade, which led to it being associated with secrecy and debauchery. Nevertheless, the custom of decorating with both Holly and Ivy during Christian holidays was eventually accepted. Although folklore surrounding the Robin Erithacus rubecula had existed for many years, it became far more widely associated with Christmas after it was depicted on Christmas cards in 19th century England; a tradition that has been retained to this day. In the 1800’s, British postmen wore a bright red uniform. These postmen were thought to resemble the Robin and consequently they earned this nickname. At Christmas, people would eagerly anticipate the ‘robins’ arrival at their door with their delivery of Christmas cards. Greeting card artists of the time began to illustrate their cards with this event, but instead of drawing a postman, they began to illustrate the postman’s namesake delivering letters in their beaks, a custom which survives to this day (despite the fact that the postmen’s attire has much changed). There are also a number of religious theories to explain this species association with Christmas. One account is that whist Jesus was on the cross a Robin pulled a thorn from his crown, and that Christ’s blood created the Robins red breast. Another is that when Jesus was asleep in the manger in Bethlehem a fire started to roar strongly; a brown Robin noticing that Mary had been distracted, placed himself between the fire and the face of baby Jesus scorching his breast in the process. A less popular aspect of Robin folklore is that a Robin gathered water for the souls in Purgatory or Hell. As it flew in these fiery places, its breast was scorched red. A common custom practiced during the Christmas period is for a homeowner to place a sprig of Mistletoe Viscum album above a door frame or hang it from the ceiling of their dwelling. During festive gatherings, any female who lingers under this decoration is fair game for a harmless kiss from nearby gentlemen. It is not understood when, or why, this tradition started although the first documented case of kissing under the Mistletoe was in the 16th Century. Its association with winter celebrations was likely originated by Pagans as it has long been considered a species with healing properties, and in Norse mythology it is associated with fertility. 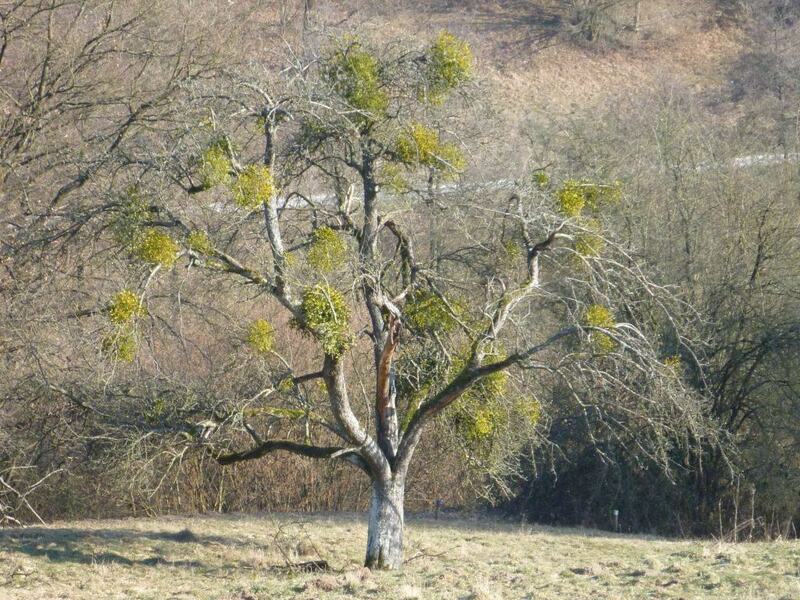 During the Medieval period people believed that Mistletoe possessed mystical powers which could bring good luck during December and ward off evil spirits. It was often used in ceremonies and then burned once the Christmas celebrations had concluded. The tradition of decorating ones home with Poinsetta Euphorbia pulcherrima plant(s) originated in The Americas. 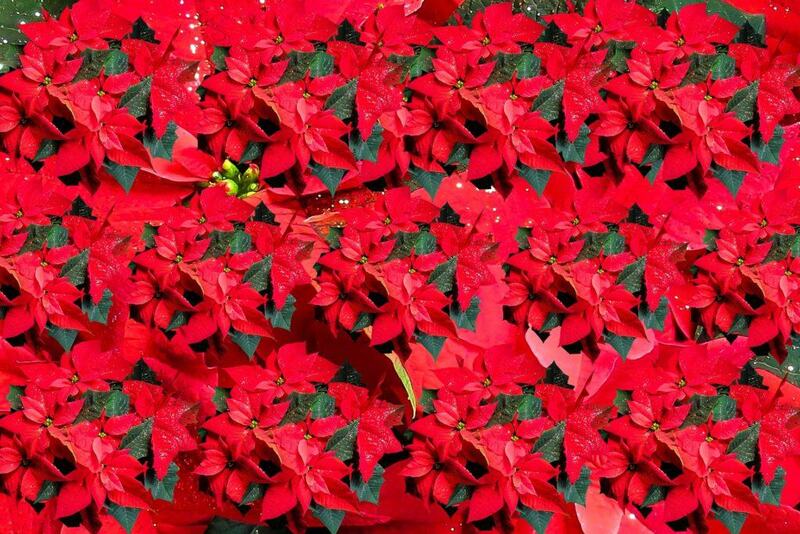 Poinsettia is native to Central America, where it flowers during the winter. The ancient Aztecs had many uses for them including using the flowers (which are actually bracts rather than flowers) to make a purple dye for clothes and cosmetics and the milky white sap was made into a medicine to treat fevers. The shape of the Poinsettia flower and leaves are thought to symbolise the Star of Bethlehem with the red coloured leaves representing the blood of Christ and the white leaves representing his purity. Coniferous trees have been used to celebrate both Pagan and Christian winter festivals for thousands of years. Pagans used the branches of trees to decorate their homes during the winter solstice, as they reminded them of the spring to come. The Romans used such trees to decorate their temples at the festival of Saturnalia (an ancient Roman festival in honour of deity Saturn held on 17th December) and Christians used them as a sign of everlasting life with God. Nobody is certain when conifers were first used as Christmas trees. It may have begun around 1,000 years ago in northern Europe when early Christmas trees may have been hung upside down from the ceiling using chains (hung from chandeliers/lighting hooks). The character of Santa Claus is largely based on St. Nicholas of Myra and Sinterklaas of Dutch folklore, both of which traveled on a white horse. In many western cultures Santa Claus travels the world on Christmas Eve delivering gifts in a sleigh pulled by flying Reindeer Rangifer tarandus with the first known written account of reindeer in association with the legend of Santa Claus occurring in 1821. Many popular Christmas traditions relating to Santa Claus originated in Holland and Germany. As Pagans converted to Christianity during the Middle Ages, their winter festivals and traditions, as well as popular Pagan beliefs, often became confused with Christian celebrations. In Norse and Germanic mythology, Thor is the God of Thunder and flies through the sky in a chariot pulled by two magical goats. 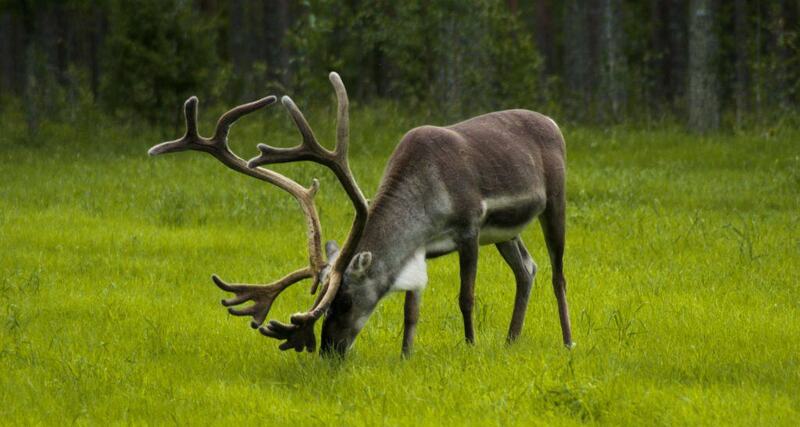 It is possible that this may have influenced the creation of Santa’s sleigh and flying, antlered reindeer, which may have also been influenced by the view that Reindeer were mysterious creatures linked to lands in the northern part of Europe. The consumption of Turkey Meleagris gallopavo at Christmas is a relatively recent tradition. Turkeys were introduced into Britain more than 500 years ago by Yorkshireman William Strickland, who acquired six birds from Native American traders on his travels. Before that, the meat of choice at Christmas was goose, swan, Wild Boars’ Sus scrofa head and even Peacocks Pavo cristatus. Henry VIII is reputed to have been the first person to eat turkey on Christmas Day, although Edward VII made eating turkey fashionable at Christmas. It was not until the middle of the twentieth century that Turkey overtook goose as the most popular Christmas Day meal. Today, the majority of families (76%) around the UK will serve up a succulent roast turkey as the centre piece of their festive meal this Christmas. Turkey is not a traditional Christmas meal in a lot of other European countries; in Portugal, the typical Christmas fare is Cod Gadus morhua, while Germans prefer Wild Boar or venison, in Sweden the average Christmas feast would include of caviar, shellfish, cooked and raw fish and in Austria you would expect to eat braised Carp Cyprinus sp. served with gingerbread and beer sauce.